Handi-Foil of America disposable pie pans. The actual top-out diameter is 9-5/8", however the manufacturer rounds this number up to 10" and lists it as a 10" pie. The retail version is named a 9" pie based on the inside diameter of 8-3/4". A fairly deep pie pan, with a 1-7/32" vertical depth. Holds approximately 33.4 fluid ounces. Widely used by bakeries and food processors across the country. Proudly made in Wheeling, IL USA by Handi-Foil of America. 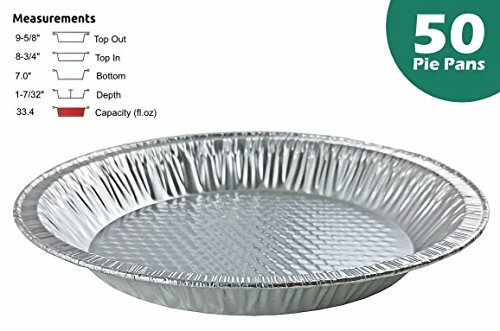 These Handi-Foil pie pans are listed by the manufacturer as a 10" pie, however Handi-Foil rounds up the actual top-out diameter which is just short of 10" at 9-5/8". The dimensions below list the precise measurements of this pan. Waffle bottom pattern, allows for sturdiness as well as even cooking temperatures. Ideal for baking pies, deserts, pastries and more. Made with sturdy 35 gauge aluminum, by America's leading foil maker. If you have any questions about this product by HFA, contact us by completing and submitting the form below. If you are looking for a specif part number, please include it with your message.